Grilled Beef Ribeye Drizzle 2 tsp olive oil on both sides of a slice of 200gm beef ribeye. 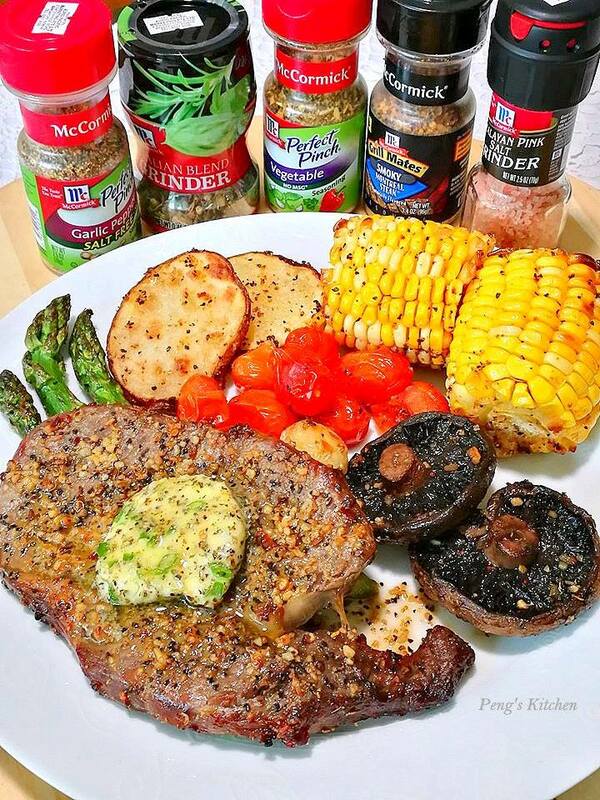 Spread 2 tsp of McCormick Smoky Montreal Steak Seasoning all over. Set aside for 30 mins. Preheat air fryer at 200 deg cel for 5 mins. Place ribeye on a baking rack. Air Fry at 200 deg cel for 10 mins. Remove and cover in a foil to rest for 5 mins before serving. Herb Butter125gm unsalted butter, 1 heap tsp McCormick Perfect Pinch Garlic Pepper, 1 heap tsp Grill Mates Smoky Montreal Steak, 1 heap tbsp McCormick Italian Blend Grinder, 2 cloves minced garlic, 1/4 cup chopped spring onion. Combine all herbs & spices with softened butter, stir well to incorporate. Place herb butter mixture over a piece of cling wrap. Roll up like a cylinder. Chill in fridge till solid. Slice and use accordingly.